As mentioned before the Arabic word ghafr, which means to forgive, is denotative of veiling and screening; hence, to forgive a sin is to veil it, efface it, and to pass it unpunished. Allah said “Who forgiveth sin.” (GHAFIR, 3) “..and He is the Oft-Forgiving, Most Merciful”(YUNUS, 107), “..is not He the Exalted in Power, He Who forgives again and again.” (ZUMAR, 5). 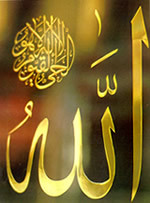 Al-Ghaffar is an intensive form that suggests recurring forgiveness again and again, hence, it is concerned with the number of times of forgiveness; on the other hand, AL-GHAFOUR, is a form that denotes perfection and inclusiveness of forgiveness, hence it is concerned with the quality of forgiveness, “Tell My Servants that I am indeed the Oft- Forgiving, Most Merciful.” (HIJR, 49). Glory be to the ALL- FORGIVING, He is Allah.